As a nature and wildlife photographer I’m outdoors a lot and I often get into scrapes. They make entertaining stories to share on blogs and elsewhere. One time, however, it was my photographic subject that got into one – or almost. I was walking home one cool August night, in the quiet seaside village of Pearl Beach where I used to live. There was no traffic, nor any street lighting, just the light of the full moon. In the dark shadows of some trees, I saw a bulky shape in the path ahead of me. I continued towards it, not particularly worried, when suddenly it flew up in front of me. I stopped in surprise. The creature flew into a paperbark tree across the road. As my eyes adjusted in the dark, I realised it was an owl – a huge one!. What had it been doing on the ground? I stared at it. It stared back at me. Should I try to photograph it? It was on a low branch about the height of telephone wires and seemed determined to stay. OK, I said to myself, let’s go for it. I turned and ran the two blocks to my house, grabbed camera, tripod, long lens and flash, hopped into my car and raced back. The owl was still there! A car was coming towards us. I was on one side of the road, the owl on the other. Spotting me, the driver slowed down. “Oh hurry up!” I silently willed the driver, thinking the car would surely disturb the owl. Then everything happened at once. A large rat sped out from a tufty bush near my feet and into the path of the approaching car. The owl swooped down after it, almost colliding with the car’s headlights and oncoming wheels. A split second and it was all over. The rat had found a larger bush; the owl had missed the car – and his meal. The driver passed by slowly, staring at me through her window, never realizing what spectacle had played out just below the hood of her car. I walked home, understanding now what the owl had been doing on the path – stalking the rat, and thinking that no matter how advanced our photographic equipment becomes, nothing will be fast enough to catch such amazing action. I normally like to prepare ahead for my photographic projects to ensure success. 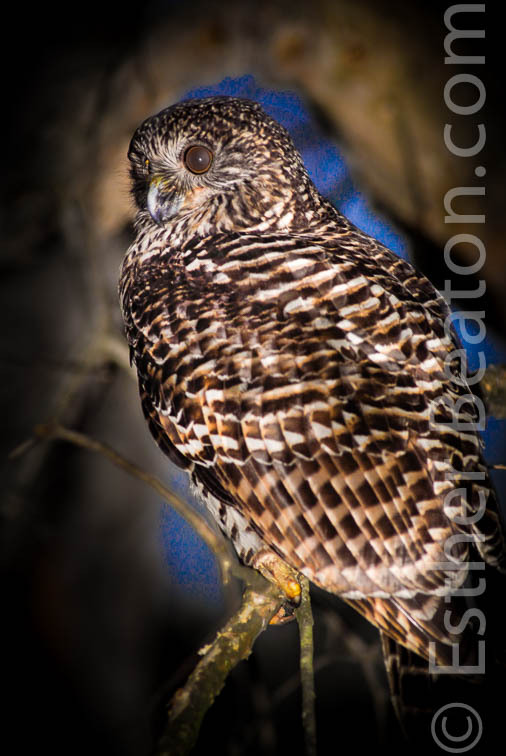 See my article on “How to Photograph Owls”. Have you had any luck photographing owls – or other noctumal animals – on the fly?